The Indian team uncovered these tools at one of India's best known archaeological sites — Attirampakkam, which is located near the present-day city of Chennai in southern India. 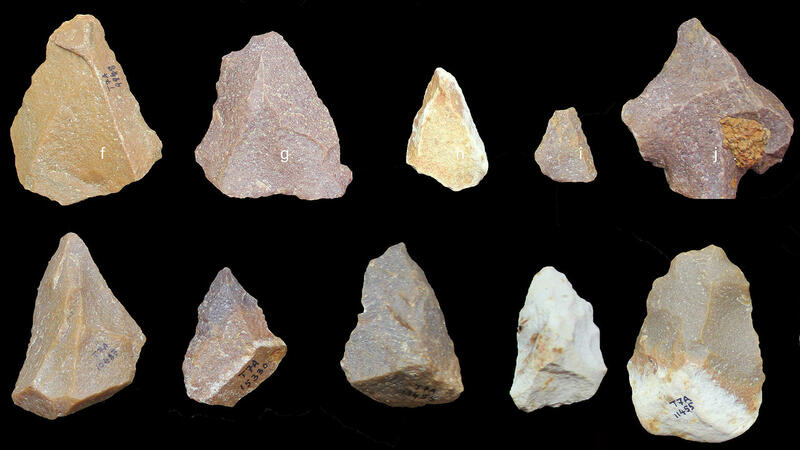 "It has a very, very long history of occupation of different prehistoric cultures in this one site," says Shanti Pappu, an archaeologist at the Sharma Centre for Heritage Education in Chennai and one of the lead authors of the new study. "It's a very specific technology, very clearly identifiable and very similar to what you see in Africa," says Pappu. The more than 7,000 artifacts discovered at the site run counter to what's been the prevailing theory about when the technology first reached the region. "It was believed that this particular cultural or behavioral package perhaps came to India about 125,000 years ago, by modern humans dispersing out of Africa," says Pappu. Another hypothesis suggested that the technology came even later to India, around 70,000 years ago. "The findings of this paper clearly knock those ideas out of the water," says paleoanthropologist Rick Potts, the head of the Human Origins Program at the Smithsonian Museum of Natural History, who wasn't involved in the study. "It has to be earlier." "This is a marvelous discovery," says Michael Petraglia, at the Max Planck Institute for The Science of Human History, who also had no role in the recent research. "It fills a very important gap in our knowledge of cultural history of humans in South Asia between 400,000 to 175,000 years ago." "It's a whodunit, and we don't have the answer," Potts says. Petraglia thinks it's the latter, since there's no fossil evidence anywhere in India suggesting that modern humans arrived there earlier. However, fossil evidence does hint, he says, that a more ancestral human species — Homo heidelbergensis — lived on the subcontinent and used some of the older Acheulian technologies. And, given that the Acheulian and Levallois technologies partially overlap at this site, "I see that as continuity in the archaeological record of India, rather than as an external influence," says Petraglia. "It looks like the Neanderthals of Europe and the near East, as well as the ancestors of Homo sapiens in Africa developed this ... Levallois technique independently of one another," says Potts. It might have developed independently in South Asia as well. "We're familiar in history of independent inventions of things like the calendar in different parts of the world." "It raises a question that all archaeologists should be asking right now," he says. "What else was going on in India and how prominent was it in the story of human origins?"